Delta’s Abby Freeman makes a pass along the baseline in a game versus Patrick Henry this season. Freeman was first team all-district in Division III. Lily Krieger of Archbold scores inside during a tournament game this season. 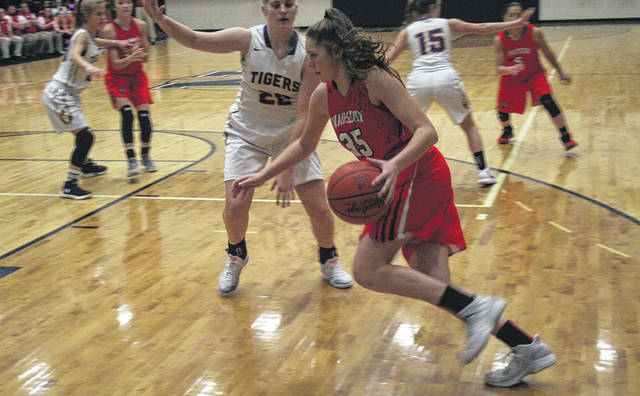 She was recently named third team all-district in Division III. Sydney Zirkle of Wauseon handles the ball against Holgate. She made honorable mention all-district in Division II. 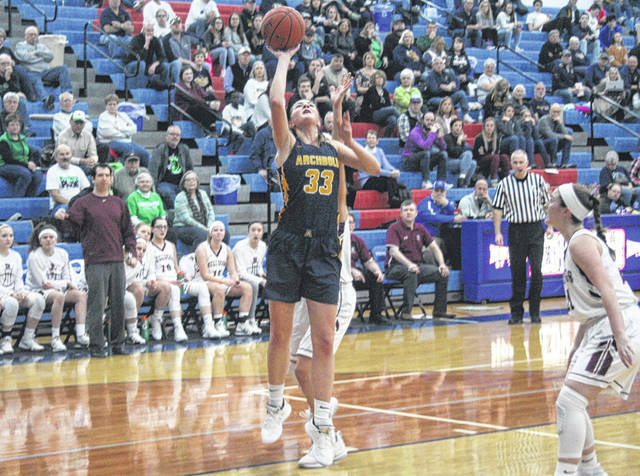 Many locals were recognized on the All-Northwest District girls basketball teams announced recently by the Ohio Prep Sportswriters Association. 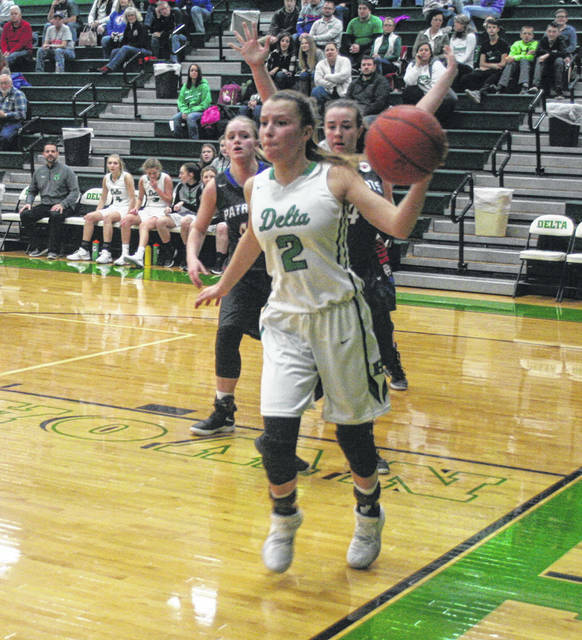 In Division III, Abby Freeman was named first team all-district for Delta. Braelyn Wymer made honorable mention all-district for the Panthers. Lily Krieger of Archbold was selected third team all-district. Also in the area, Averie Lutz of Swanton was honorable mention. Wauseon had a pair honored in Division II. Receiving honorable mention all-district for the Indians were Marisa Seiler and Sydney Zirkle. Morgan Leppelmeier of Pettisville made the all-district first team in Division IV. Trista Fruchey of Fayette was honorable mention all-district. Zia Cooke, Toledo Rogers, 5-9, sr., 22.5; Casey Santoro, Bellevue, 5-4, jr., 21.9; Cassidy Crawford, Willard, 5-10, jr., 20.2; Madison Royal-Davis, Toledo Rogers, 5-10, so., 17.9; Emma Randall, Shelby, 5-9, sr., 13.7; Shae Pedroza, Napoleon, 5-5, jr., 12.7; Chandler Clark, Lima Bath, 5-5, so., 12.8. Olivia Howard, Sandusky Perkins, 5-6, sr., 17.2; Cory Santoro, Bellevue, 5-5, so., 17.0; Kaia Woods, Tiffin Columbian, 5-0, so., 17.0; Bailey Walter, Shelby, 5-9, sr., 13.7; Kennedy Lamberson, Bryan, 5-8, sr., 14.2; Lexi Robinson, Lake, 5-11, sr., 16.7. Savanah Richards, Liberty-Benton, 5-8, sr., 19.1; Erin Kaufman, Ottawa-Glandorf, 5-6, sr., 12.9; Jessica Bowerman, Seneca East, 5-9, so., 14.8; Cora Wyers, Collins Western Reserve, 6-0, sr., 16.1; Abby Freeman, Delta, 5-6, sr., 14.8; Jayden Moore, Margaretta, 5-8, jr., 13.5; Jamie Schmeltz, Eastwood, 5-10, jr., 17.4. Player of the Year: Savanah Richards, Liberty-Benton. Coach of the Year: Eric Kochendoerfer, Margaretta. Caitlin Elseser, Liberty-Benton, 6-3, jr., 15.0; Ashley Schroeder, Ottawa-Glandorf, 5-6, sr., 9.4; Kathleen Leeper, Ashland Crestview, 5-8, jr., 14.6; Lauren Gilliland, Coldwater, 6-0, jr., 12.5; Mercedes Wagner, Fairview, 6-1, sr., 17.2; Danielle Horsley, Colonel Crawford, 5-9, sr., 11.2; Sammi Mikonowicz, Rossford, 5-10, jr., 19.7. Kennedy Pratt, Arcadia, 6-2, sr., 14.0; MaKayla Elmore, Hopewell-Loudon, 6-3, so., 21.3; Jessie Grover, Lucas, 5-8, jr., 18.6; Ivy Wolf, Minster, 5-8, so., 13.8; Morgan Leppelmeier, Pettisville, 5-8, sr., 19.2; Courtney Prenger, Minster, 6-2, sr., 11.1; Claire Sinn, Wayne Trace, 5-8, jr., 14.3; Courtney Pifher, New Washington Buckeye Central, 6-0, sr., 14.0; Kasey Knippen, Ottoville, 5-7, sr., 15.3; Alivia Koenig, Bluffton, 5-5, sr., 12.8. Player of the Year: Makayla Elmore, Hopewell-Loudon. Co-coaches of the Year: Abram Kaple, Buckeye Central; Steve Brown, Stryker. Jenna Pepple, Arlington, 5-6, sr., 13.0; Alivia Light, North Baltimore, 5-7, sr., 17.9; Brooklyn Gillig, New Riegel, 5-6, jr., 12.0; Danielle Smith, Norwalk St. Paul, 5-7, so., 14.7; Madilyn Hohenberger, Holgate, 5-9, sr., 16.0; Emma Grime, Stryker, 5-7, sr., 15.6; Claudia Pifher, Buckeye Central, 5-9, fr., 15.0; Olivia Grove, Bucyrus Wynford, 5-10, sr., 11.5; Rylee Sybert, Columbus Grove, 5-8, sr., 14.1; Betty Vorst, Delphos St. John’s, 5-8, sr., 13.3.
https://www.fcnews.org/wp-content/uploads/sites/45/2019/03/web1_Freeman-makes-pass.jpgDelta’s Abby Freeman makes a pass along the baseline in a game versus Patrick Henry this season. Freeman was first team all-district in Division III.